It's important to remember that not all body armor is created equal, nor is ballistic steel for that matter. AR500 Armor® is known for manufacturing the highest quality and most affordable level III body armor in the industry. Rugged, Reliable, and Proven time after time, AR500 Armor® utilizes a proprietary ballistic steel core that truly sets us apart from other ballistic body armor solutions. Watch the videos below for results and benefit of what AR500 Armor® has to offer by using high quality materials and the latest manufacturing techniques and technology available. Also, don't forget to check out our Level IIIA & Level IV Body Armor! All AR500 Armor Body Armor is manufactured from our proprietary ballistic steel core designed to our specifications, which is purpose built for our body armor applications. Certified and treated to our specifications, all of our body armor is manufactured 100% in-house with rigorous quality control standards; required to meet our ballistic resistance test standards, we make absolutely no exceptions. All of our body armor undergoes Certification Testing pre and post production, including Independent Lab Testing, and In-house ballistic resistance testing. Calibers used for testing in the following videos include .22lr, 9mm, .40 S&W, .45 ACP, 10mm, 44 magnum, .223, 5.56 (M855/SS109 62gr Penetrator), 7.62x39, 7.62x51 M80 NATO Ball (.308 Winchester),12 Gauge 1oz Magnum Slug and 00 Buckshot, 7.62x54R, and .338 Lapua! In our Body Armor Stress Test we run our Body Armor over with a 9,600lb Loaded Forklift, perform multiple drop tests on each surface area from 15 feet onto a hard steel plate, and follow up with live fire testing of some hard hitting rounds at just 20'. This distance is less than half of the required distance of NIJ-STD-0101.06 ballistic resistance test standards. We put our armor to the test - Literally. AR500 Armor® Body Armor is designed to be rugged and reliable; built to outlast any other armor platform on the market. Our armor plates can withstand unprecedented conditions, are maintenance free, chemical resistant, and stress fracture resistant. What does this mean? 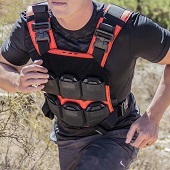 It means we manufacture our Body Armor to outlast any other alternative currently available at the most affordable price point in the industry. What is Back Face Deformation? Back Face Deformation is a term used for measuring the amount of deformation in a ballistic clay block on the back side of body armor, after taking a round. In this video we go into detail on why this is important, and how our armor performs in this critical test. AR500 Armor® Hybrid IIIA Soft Body Armor, and Level III Body Armor put to the test by FPS Russia! Dimitri puts both our soft and hard body armor up against some heavy hitting calibers including .500 Smith & Wesson, .458 Socom, and .50BMG! Our level III 10" x 12" base model body armor, which costs only $65, is put through an extreme torture test by Demolition Ranch! Rifles, Shotguns, and an Explosion! Iraqvetran8888 performs a thorough review on AR500 Armor® Level III Body Armor. Philosophy of Body Armor, usefulness of owning Body Armor, and a full live fire review and demonstration of AR500 Armor® Body Armor performance against a variety of calibers, including 30-06 and a .500 Smith & Wesson! As well as showcasing our industry leading PAXCON spall & fragmentation mitigation protective coating. For this in house test we bring in a heavy hitter - Romanian PSL chambered in 7.62x54R. With some serious power behind it's tail, the 7.62x54R and all its glory fails to penetrate AR500 Armor® Level III Body Armor. We send (5) Steel Core 147 grain Military Surplus rounds down range at just 30 yards into our Level III Body Armor; pulled straight from the production line backed by our 70lb ballistic gelatin torso. It's important to note that 7.62x54R does exceed the Level III threat rating. That said, we prefer to over build AND over deliver. AR500 Armor® level III Body Armor and our PAXCON spall & fragmentation mitigation coating is pushed to the extreme against 5.56 Incendiary (API) with a hardened steel core. At just 30 yards we fire 3 rounds center mass from a BCM Jack Carbine. Our Ballistic Body Armor is backed by our 70lb ballistic gelatin Torso. You can clearly see the effects of the round and how they differ on impact of the strike face compared to traditional 5.56x45 M855 rounds. Despite the flames and sparks the silver tip 5.56 API round fails to penetrate our level III armor. AR500 Armor® Playlists - Watch live fire Body Armor tests from .22lr to .50BMG! Learn application of body armor in your life, and how to properly setup your plate carrier and armor to provide maximum protection of your vitals. Over 3 hours & 45 minutes of AR500 Armor® Body Armor Testing through 35+ videos! We are quite possibly the most independently reviewed and thoroughly tested level III 10" x 12" Body Armor system in the world! Plate Carrier & Body Armor Basics Series. Everything you need to know about how to wear body armor, by Independence Training and AR500 Armor®. We cover a variety of topics including proper fitment to ensure vital coverage, donning and doffing, stock weld, transitions with sling, first line gear, and more! AR500 Armor® How-To's run through the basics. How to insert body armor into your plate carrier, proper plate ride height for adequate protection, and how to adjust for a proper fit.